Although officially it was Edinburgh CC v London CC, the newspapers of the day, The Scotsman included, were calling it the Scotland v England Chess Match and giving regular reports of its progress. Scotland won the match and to this day the opening used by Edinburgh to defeat London in the deciding game is called The Scotch Game. 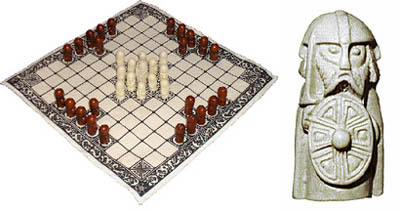 Illustrations: Hnefatafl board and pieces; and a(nother) Lewisian conversation.